Shortly after Dreamforce last year, I talked about what I felt made the Salesforce world so different (hint, the community). I still believe that very much, and for that reason I’m looking forward to Dreamforce ’15 more than ever. I’m staffing the “Coding for Admins” booth in the admin zone on Wednesday from 10-Noon (PST). I hope to meet some new folks there and to help them out — not because that’s what is expected, but because that is what I enjoy doing. I’m also looking to reconnect with those that I already know but don’t get to see often or at all save for events like this. For me — this is very personal. Many of these people are like those cousins that you love to hang out with but rarely get to see. 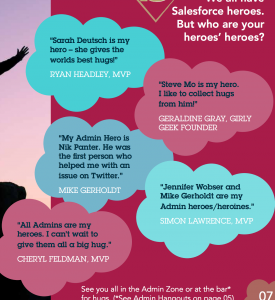 Jenny Bamber (@Jenny_Bamber) recently released a “Unofficial Guide to Dreamforce”. I’d like to call your attention to page 7. On that page are five quotes. Three of these five are very similar. I’ll give you a second to figure out what the similarity is…go ahead….I’ll wait (screenshot below for the impatient). Welcome back. Did you figure out what the similarities were? Three of those five quotes mention hugs. When I attending conferences, meetups, etc from other technology stacks, it was hard enough to shake hands, but “here” its like family. We hug, we laugh, we share stories both work related and personal, both happy…and sad. It literally feels like extended family (without that creepy uncle nobody talks about). So this year, Dreamforce feels very personal for me and I’m looking forward to the stories whether happy or sad, the new friends and faces, the old friends….and the hugs.